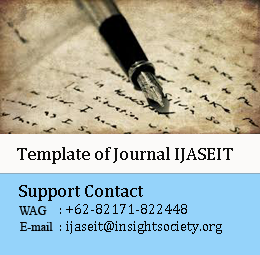 The IJASEIT is an online, multi-media, academic journal that adheres to the highest standards of peer review and engages established and emerging scholars from anywhere in the world. 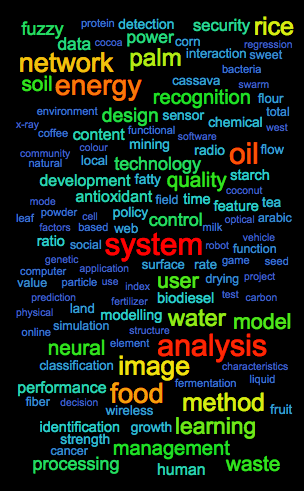 We invite qualified research articles in all aspects of science, engineering and information technology. As the commitment to fast publication, editors try their best to complete a review process up to eight weeks. If authors did not receive any notification after that period, please do send an email to editors. International Journal on Advanced Science, Engineering and Information Technology (IJASEIT) is loyal to open access for academic work. All the original articles and review papers published in this journal are free to access immediately from the date of publication. We don’t charge any fees for any reader to download articles and reviews for their own scholarly use. International Journal on Advanced Science, Engineering and Information Technology (IJASEIT) publishes fully open access journals, which means that all articles are available on the internet to all users immediately upon publication. Non-commercial use and distribution in any medium is permitted, provided the author and the journal are properly credited. Benefits of open access for authors, include: Free access for all users worldwide, Authors retain copyright to their work increased visibility and readership, Rapid publication, No spatial constraints. Before submitting articles to reviewers, those are first checked for similarity/plagiarism tool, by a member of the editorial team. The papers submitted to International Journal on Advanced Science, Engineering and Information Technology (IJASEIT) must have similarity level less than 15%. International Journal on Advanced Science, Engineering and Information Technology (IJASEIT) is an open access journal. However, it is very pleased to inform you (All Authors) is requested to pay a publication fee for each article accepted. Start from July 2018, for service improvement, this journal charge the article publication fee for supporting the cost of wide open access dissemination of research results, managing the various costs associated with handling and editing of the submitted manuscripts, and the Journal management and publication in general, the authors or the author's institution is requested to pay a publication fee for each article accepted. The author is not allowed to withdraw submitted manuscripts, because the withdrawal is waste of valuable resources that editors and referees spent a great deal of time processing submitted manuscript, and works invested by the publisher. If author still requests withdrawal of his/her manuscript when the manuscript is still in the peer-reviewing process, author will be punished with paying $200 per manuscript, as withdrawal penalty to the publisher. However, it is unethical to withdraw a submitted manuscript from one journal if accepted by another journal. The withdrawal of manuscript after the manuscript is accepted for publication, author will be punished by paying US$400 per manuscript. Withdrawal of manuscript is only allowed after withdrawal penalty has been fully paid to the Publisher. If author don't agree to pay the penalty, the author and his/her affiliation will be blacklisted for publication in this journal. Even, his/her previously published articles will be removed from our online system.